Well, although it’s probably easy to decide that you want an office chair, everything after that isn’t exactly as easy. Ranging from choosing the right office chair for your needs to dealing with the problems you may come across while using it, there are quite a few things you need to know about to get the most out of it. However, many of these things depend on how you go about choosing your office chair. If you pick any random one from the market, chances are you will end up disappointed. You may want to be careful about choosing the right style as unless the chair’s style is right for your needs, it may not be as comfortable over a period of time as it initially would be. Similarly, you may also need to make sure you’re aware of the right way to use the chair. While some chairs are designed for holding only a low amount of weight, some other can hold considerably more. Finally, you may want to ensure that the chair is fit for being used for extended periods of time, as there do seem to be a few office chairs out there that are good to be used for short periods of time, and get uncomfortable when you sit on them for too long at a time. That being said, here are three of the most common problems you may come across while using your office chair, as well as the solutions for getting around them. The decrease in the quality of the seat cushion is one of the most common problems with office chairs. While the cushioning may seem great for a few weeks, it doesn’t take long for it to get considerably uncomfortable over time. This is usually because either the chair hasn’t been designed to be used for extended periods of time, or the material used to build it isn’t of a very good quality. As far as the first problem is concerned, you can simply inquire for such details from the salesperson if you’re buying it offline, or read some user reviews if you’re buying it online. This will help you understand whether the chair is actually being fit to be used for extended periods of time without experiencing a drop in the comfort level. Coming to the second issue, you need to be a little careful about it. While you may be no expert at testing the quality of material used in office chairs, you can kind of guess by getting a feel of it. If you’re buying it offline, you can seat on it for some time, and while getting back up, you can observe how the cushion reacts. If it doesn’t regain its shape immediately, the quality is very likely to be a little disappointing. On the other hand, if it regains its shape as soon as you get up, it may be built using quality materials. While buying online, again, you may have to rely on other users’ reviews, but you should still be fine as the verified reviews are usually genuine enough. Well, chair mats are offered for a reason. While many chairs do come with a standard castor, it’s usually not enough to protect your carpet or hard floors from grooves and damages. 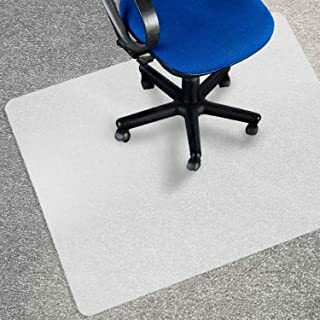 Using a chair mat makes it comfortable to move around while you’re sitting on the chair. Many manufacturers recommended users to get a chair mat, especially if you have a hard floor such as laminate, tile or hardwood floors. It’s also pretty common for the gas cylinder or pneumatic cylinder to cease working properly. This leads to you sinking down in the chair while sitting on it. The only possible solution for this may be to replace it. However, most quality chairs would come with a warranty that covers the gas cylinder’s replacement so you may not have to shell out any money. As for the reasons for the gas cylinder not working as it should, it could either be due to having to hold excess weight or getting too old.